But a criminal arrest won’t plaster over the City’s role in the conflagration. In the course of gentrifying its downtown–I was a part of the first wave of gutter grad students behind the Paramount Theater–Oakland threw in with the Bay Area’s real estate bubble that a decade later had priced out the very artists–and cottage scientists–that the City used as the new real estate’s now bloody bleeding edge. An analogous tug-o-war is found in characterizing the latest wave of bird flu outbreaks across Europe and North America. Big Poultry, offering influenza millions of birds on which to feed, is blaming wild waterfowl, for centuries already a reservoir of nearly all flu recombinants, for the sudden Cambrian explosion of H5 outbreaks: H5N1, H5N2, H5N3, H5N6, H5N8, and H5N9. Research under the aegis of University of Minnesota Professor Carol Cardona, the industry-funded Pomeroy Chair in Avian Health, claims that climate change is driving shifts in wild waterfowl ecology here in Minnesota and, it follows, in influenza epidemiology, leading to novel spring outbreaks in industrial poultry. Following exhaustive sampling conducted by state ornithologists finding no H5N2 in wild waterfowl in Minnesota, Cardona’s team is trying again, searching for H5N2 in spring 2015 samples. Because it must be there, the argument reaches. But what would such a search, if successful, even show? The aim appears a modeling framework that isolates possible effects to demonstrate that this change in waterfowl ecology must have lead to this sudden outbreak of H5N2. That possibility omits addressing why multiple influenza strains, including H5N2 and many of the new H5Nx clade 2.3.4.4 strains now plaguing Europe, Asia, and the Middle East, develop a deadliness in industrial poultry they don’t exhibit in waterfowl. 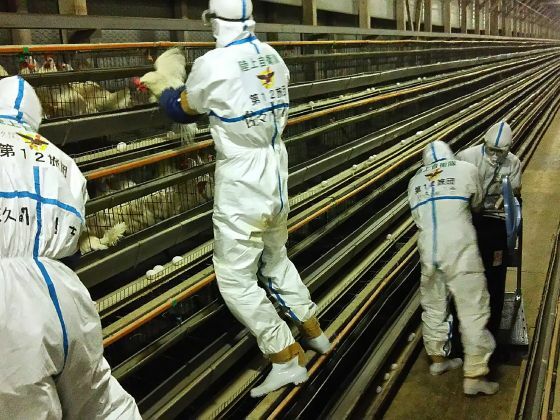 As a growing literature in modeling such virulence shows-–here and here to start-–intensive husbandry, raising barns of thousands of poultry in packed homogeneous monoculture, offers so much food for flu (and other pathogens), spurring the evolution of explosive deadliness. A continual supply of cramped-in genetic clones removes the typical cap on how deadly influenza can be. One cohort after another every six weeks, there’s always another big batch of immunologically weak susceptibles through which to burn. It so happens, new research shows, that the broader environment on which Cardona is banking likely had only marginal effect on the emergence of the new H5 influenzas anyway. In a paper just accepted by eLIFE, a team led by Belgian spatial ecologist Marius Gilbert shows models explaining the difference in spatial distributions between the H5N1 subtype and its daughter H5Nx that included popular eco-climatic predictor variables, such as land surface temperature, open water, and vegetation, added little in explanatory value. Instead, it’s the combination of host types that best explained the distribution of outbreaks. 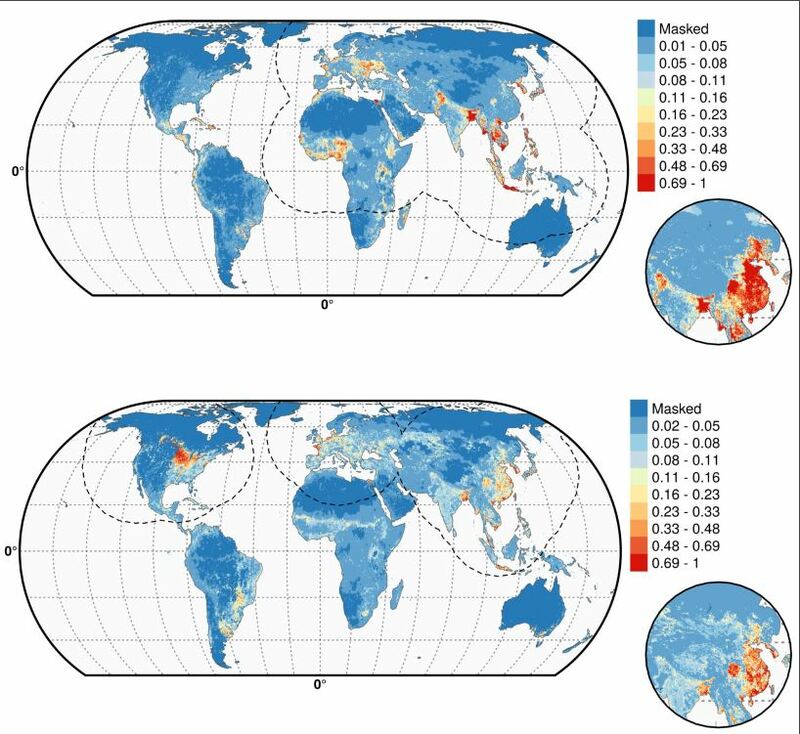 As shown in the nearby figure, Gilbert’s team inferred the relative contributions the various predictor variables made in explaining the global spatial distributions of old school H5N1 (blue) and newbie H5Nx (red). 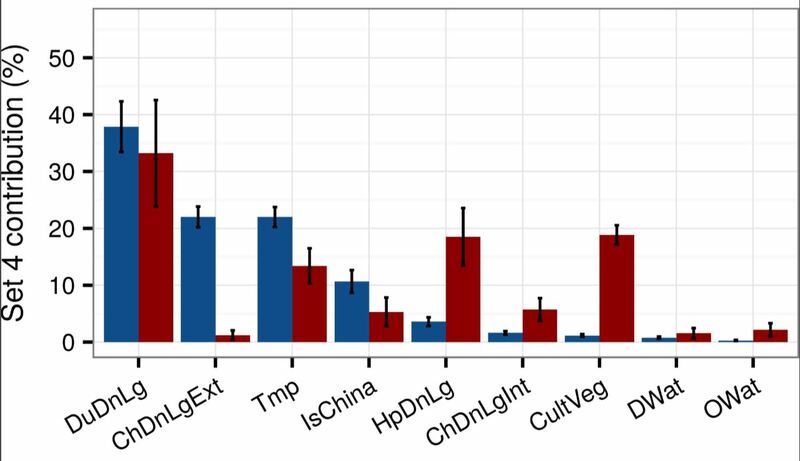 Yes, the intermediary reservoir of duck density (DuDnLg) is a major contributor to both–although less so for H5Nx–but check out the shift from extensive chicken production (ChDnLgExt) to urbanized human populations (HpDnLg), intensive chicken production (ChDNLgInt), and managed horticulture (CultVeg). The team globally projected the resulting shift in influenza niche, showing, in the nearby maps, documented hot spots of H5N1 (top) and H5Nx (bottom). We see, as reported by the press, H5Nx now in the U.S., Europe, China, and South Korea, of course, but also newly projected vulnerable areas, under the constraint of applying data from the early stages of an ongoing outbreak: Bangladesh, Indonesia, Australia, parts of South America, and, prophetically it turns out, the Nile delta. It isn’t just a matter of a shift in viral opportunity. The new H5 influenzas apparently have also evolutionarily adjusted to these metropolises of industrial poultry. In another ahead-of-publication paper, due out in February, a team of virologists from Utrecht University and the Scripps Research Institute show an evolution in the hemagglutinin molecule–the H of H5–that permits the influenza virus to key into its target cells. A rare amino acid substitution K222Q (H3 numbering) in the receptor-binding moiety permits the new H5Nx both broader and more efficient binding to what are called fucosylated sialosides of the 3′SLeX type. That is, the virus has switched from binding specifically to waterfowl receptors (in their intestines) to expanding into a poultry-inclusive adaptation (also now infecting poultry in their throats). The changes may account for the accelerated reassortment with multiple neuraminidase segments–the N of H5Nx–as the balance between targeting sialocide receptors, as hemagglutinin does, and removing them, as neuraminidase does, recalibrates. The amino acid replacement may also produce an expansion in host range and increases in the rate and extent of spread. Viral shedding and pathogenesis may also be affected. Luck would have it the team found no adaptation to mammalian sialosides. So no serious human spillover likely. But it was H5N8 alone that the researchers tested and we are in early days yet. The take-home, however, is that we have here disparate ecological and evolutionary analyses converging upon the conclusion the new H5Nx are increasingly influenzas of intensive poultry. That is, a growing literature of exquisitely documented science churns inexorably onward from out beyond the control of the “Silicon Valley of food,” as agribusiness giants describe Minnesota food science. In contrast, the Pollyannaism on the part of richly remunerated researchers Big Poultry feeds, blaming anything and anyone other than the economic model at the heart of industrial poultry production, is beginning, in a revenge of the repressed, the loaded disavowal exploded, to take on the smell of a mulched pile of culled fowl. This entry was posted on December 9, 2016 at 2:20 pm and is filed under Ecological resilience, Evolution, Influenza with tags Carol Cardona, eco-climatic, Ghost Ship, H5, H5N1, H5N2, H5N3, H5N6, H5N8, hemagglutinin, intensive poultry, Marius Gilbert, monoculture, neuraminidase, Oakland, reassortment, sialosides, University of Minnesota, virulence, waterfowl. You can follow any responses to this entry through the RSS 2.0 feed. You can leave a response, or trackback from your own site.